The 2019 KMI will be October 5th at Kuna High School. Come back soon for more information! 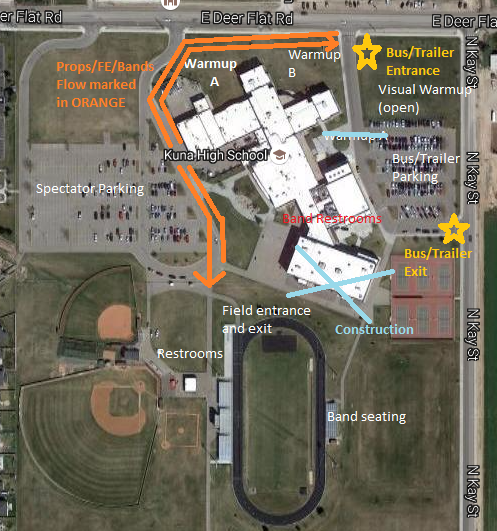 As there is construction going on alongside the southern portion of the school, there will be an alternate route this year to move equipment and bands to the performance area. Please see the orange route on the map above. ​Upon arrival to Kuna High School, entrances and exits will be clearly marked and guides available to direct parking, directors and bands. Band parking is taken care of on a first-come, first-served basis with the main entrance being the north driveway just east of the main building. Historically, we've had plenty of room for bands to park in our east parking lot. If you do have a concern with parking ahead of time, please feel free to let us know. ​Concessions will be available for purchase (and profits do go back into the Kuna Band program) on the west side of the football field behind the press box. 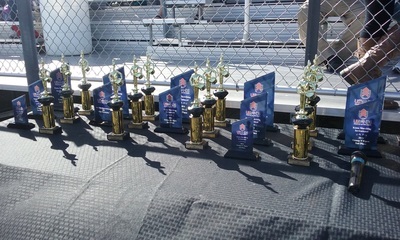 Judges will be available for comments after the show if directors would like to enter the building through the entrance near the band restrooms. Judges will be in the choir room, 104. A director's lounge will be provided in room 103. Directors, please feel free to leave a comment below so that we can continue to make the KMI as band-friendly as possible. Thank you!